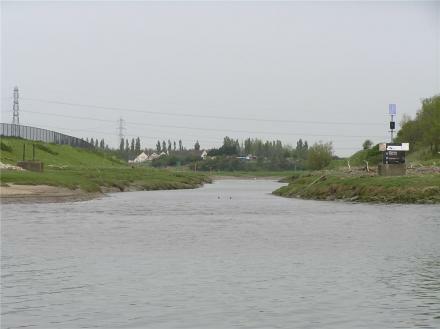 Ribble - Savick Brook Junction is a major waterways place minor waterways place place on the waterways major waterways place village town city at the junction of the River Ribble with the Ribble Link. Douglas Mouth (Junction of River Ribble and River Douglas) is on the River Douglas, 3 miles and 3¼ furlongs to the west. Preston Marina is on the River Ribble, 2 miles and ¾ furlongs and 1 lock to the east. Ribble Link Lock No 9 (Sea Lock with rotating gates) is on the Ribble Link, 4 furlongs to the northwest. The nearest place in the direction of Preston Marina is Preston Marina Junction (Junction of the River Ribble and the Preston Marina Arm); 1 mile and 4½ furlongs away. The green light allowing passage up the link wasn't working for our passage, but this view shows what the tide should be like if the link is accessible. Manchester — 1624 yards to the southwest. Lea Gate GarageBlackpool Rd, Preston, PR4 0 — 1178 yards to the north. 93 Holmefield Rd, Lytham St Annes, FY8 1JX — 1135 yards to the north. skip lane hutton, Preston, PR45LD — 1503 yards to the southeast. Preston — 1331 yards to the southeast. Wallend Road, Preston, PR2 2HW — 1095 yards to the east. Blackpool Road, Preston, PR4 0XB — 1207 yards to the north. Lea Gate Garage, Blackpool Road, Preston, PR4 0XB — 1213 yards to the north. Wallend Road, Preston, PR2 2HW — 1288 yards to the east. Blackpool Road, Preston, PR4 0XB — 1160 yards to the north.